Mystery Worshipper: The Holy Fool. 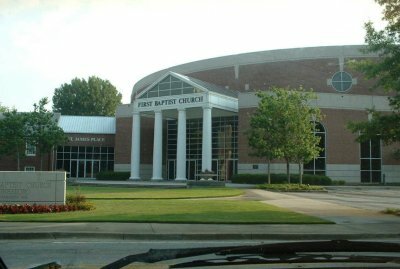 The church: First Baptist, Jonesboro, Georgia, USA. The building: The building is a huge worship center that probably seats 2,500-3000. I've visited this church before, and the interior ceiling has always reminded me of the starship Enterprise from the Star Trek. It is a large rounded ceiling with many lights. It looks as if the Enterprise has crashed into the building with half of the saucer section now comprising the ceiling. There is a huge silver cross with an amethyst the size of a basketball hanging on the baptistry wall about 25ft above the choir loft. The church: The church prides itself on its friendliness says the pastor and this is certainly mostly true. During the fellowship of believers time (which oddly came halfway through the service) even children came up to shake my hand. The neighbourhood: The neighborhood is dominated by houses which the church has purchased to use for educational space. This is a church that has had phenomenal growth and is slowly taking over the entire area. The cast: The Pastor Dean Haun is the central character. They did have a family in the church (called the host family) give a welcome to worship which doubled as a commercial for the church. It was a nice personal touch, however. Unfortunately I didn't get their names. The lower area was mostly full, the balcony area was mostly empty. I'd guess there were 1,000-1,500 present. Someone reported they had over 700 in Sunday School that morning. An usher said, "Good morning" as he handed me a worship bulletin. During the fellowship of believers time several people shook my hand, although my impression was that this was a great time for folk in the congregation to catch up on last week's sports scores, etc. Even when they began a fellowship chorus, most people ignored it and kept talking. One man came up to me during the fellowship chorus and tried to engage me in conversation. Although I appreciate the gesture, I felt guilty talking about where I was from whilst I was supposed to be singing, "Blessed be the Lord God Almighty". It was a pew and was comfortable. The organist played, but could hardly be heard over the chatter. I had trouble preparing myself for worship, but I must admit that this wasn't really my kind of worship anyway. "Well, good morning. Happy Fathers' Day". The Hymnal for Worship and Celebration, together with a large screen that came up and down over the baptistry on which all the words to the songs were projected. They didn't have a pew Bible. Organ and a small orchestra. The style of worship was breathlessly fast-paced. This was most evident in the pastor's prayer time. He hardly took a breath as he flew through the prayer. Two of my praying pet peeves are when people say, "We just want to..." or when they punctuate their prayers with God, Lord, Father, etc. He did both, as did the unnamed gentleman who prayed the offertory prayer. I think they are shooting for a rather casual contemporary style, but are also trying not to offend older Southern Baptists. The congregation clapped at a moment's notice: for the family who welcomed us; for the choral worship soloist; for the people who joined the church; for the vacation Bible school video and so on. This isn't what I would call cutting edge contemporary style, especially given that the sermon was long, and there was very little use of visuals (except for printed words, which I don't count as visuals). 6  For what is probably the longest sermon I've ever sat through, he did a remarkable job of holding my attention. I was expecting to disagree with most of the preacher's comments, however I was pleasantly surprised to find we were in agreement on the main points. His style was mildly authoritative ("Write this down...listen to this") but not excessively so. I would have given him a higher grade, but he makes the same mistake that many Southern Baptist ministers do. They talk about the Bible, but rarely seem to reference it directly. His sermon was built on Romans 13:8, but actually was only about Romans 13:8A and that slightly out of context. What he did was an outstanding, wonderful, well-thought out and presented lesson on getting out of debt and he applied it to spirituality really well. My definition of a sermon, however, is that it actually interprets scripture. His didn't do this. Debt enslaves us and prevents us from being what God wants us to be. We must develop a discipline of eliminating the debt in our lives and our families will be stronger. He gave lots of practical suggestions such as the importance of making a written budget. The best sound bite of the sermon was when he told us that we shouldn't get out of debt in order to buy more things, but in order to be better able to spend our money the way God wants it spent. He did a good job of warning us of our culture's desire to make us discontent with what we have. I really enjoyed the sermon (even though it was over half the service-time wise) although I hope heaven won't be a long debt-reduction seminar. The service didn't hang together or flow, but was just one choppy thing after another. If the other place is defined as chaos, then their worship planners are experts on the topic. I really hated having everyone ignore the fellowship chorus. I'm not a big fan of choruses, but if we're going to sing them, I think we ought to pay attention to them. If the other place is a self-centered place where God is ignored, then they did a great job of simulating it for me. There was a huge crush of people rushing to the parking lots in order to get out of there. Most people simply flowed past me, but they were very pleasant about it. There wasn't any. The pastor was supposed to greet people in the grand foyer, but I couldn't find him for the crowd. 1  It really wasn't my kind of place. It didn't make me embarrassed to be a Christian. Given that this is a mega church that is a pretty ringing endorsement from me. Probably the pastor's comment about getting out of debt in order to be able to give God more. It didn't sound self-serving, but truly spiritual. He made me think about my spending and giving habits.